Item Code: Features:Chloroprene Rubber reinforced with small textile fiber as one of main compound elements, which have excellent heat&oil resistant function and provides high stability and minimizes deflection in the cross section. 1. Chloroprene Rubber reinforced with small textile fiber as one of main compound elements, which have excellent heat&oil resistant function and provides high stability and minimizes deflection in the cross section. power transmission while at the same time ensuring length stability. 3. Molded Notches/Cogs covered by strong Elastic fabric increase anti-abrasion function, optimum fit in the pulley grooves and more flexibility, reduce thermal and bending stresses. YD LIONTM AGRICULTURAL V BELT are supplied according to the ISO and ASAE standards. ISO 3410, section dimensions in mm. ISO 3410 uses datum belt length Ld [mm] which corresponds to pitch belt length Lp [mm]. ASAE 211.4), section dimensions in inches. ASAE specifies effecive belt length Le in mm. 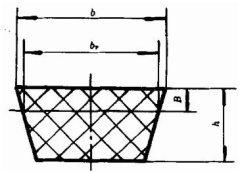 ASAE 211.4), section dimensions in mm. Belt angle = pulley angle + 2。as a guideline.